2.5% Albendazole drench with selenium and cobalt. For the control of roundworms, lungworms, tapeworms, adult liver fluke and fluke, and roundworm eggs. Dosage: Sheep 5mg/kg (7.5mg/kg for fluke), Cattle 7.5mg/kg (10mg/kg for fluke). POM-VPS. A pale green, free-flowing suspension. A broad spectrum multi-purpose anthelmintic for the control of mature and developing immature forms of gastrointestinal roundworms, lungworms, tapeworms and adult liver fluke in cattle and sheep. The product is also ovicidal against fluke and roundworm eggs. Roundworms: Ostertagia, Haemonchus, Trichostrongylus, Nematodirus, Oesophagostomum, Bunostomum, Cooperia, and Strongyloides spp. The product is ovicidal and will kill fluke and roundworm eggs, thus reducing pasture contamination. The product also contains selenium and cobalt as nutritional supplements. Selenium and cobalt are included as nutritional supplements and are not intended to be used therapeutically. 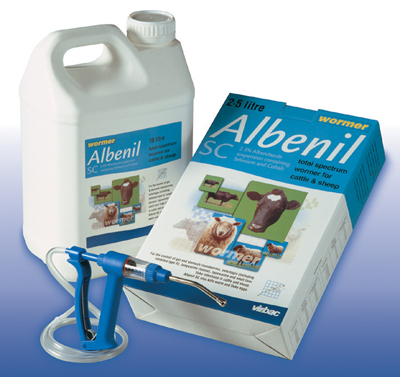 Administration of ionophores to lambs has been shown to enhance selenium bioavailability. Concurrent administration of ionophores and Albenil 2.5% SC may therefore lead to an increased risk of selenium toxicity. Cattle suffering from severe lung damage due to heavy lungworm infestation may continue to cough for some weeks after treatment. Suspected clinical cases of resistance to anthelmintics should be further investigated using appropriate tests (e.g. Faecal Egg Count Reduction Test). Where the results of the test(s) strongly suggest resistance to a particular anthelmintic, an anthelmintic belonging to a different pharmacological class and having a different mode of action should be used. Resistance to benzimidazoles (which includes albendazole) has been reported in Teladorsagia Haemonchus, Cooper and Trichostrongylus species in small ruminants in a number of countries, including the EU. Resistance to albendazole has been reported in Cooperia and Teladorsagia species in cattle in developed countries such as New Zealand. Therefore the use of this product should be based on local (regional, farm) epidemiological information about susceptibility of nematodes and recommendations on how to limit further selection for resistance to anthelmintics. Care must be taken not to damage the pharyngeal region when dosing, particularly in sheep. Do not administer other cobalt and selenium supplements concurrently with this product unless specifically advised by your veterinary surgeon. Not to be diluted or mixed with other products. Intensive use or misuse of anthelmintics can give rise to resistance. To reduce the risk, dosing programmes should be discussed with a veterinary surgeon. The product should only be used in areas where deficiencies of selenium and cobalt are likely to occur. In cases of doubt, consult a veterinary surgeon. Avoid direct contact with the product. Wear suitable clothing including impermeable rubber gloves. In the event of accidental eye exposure, flush eye thoroughly with running water. If irritation persists, seek medical attention. In the event of accidental skin exposure, wash the effected area with soap and water. If irritation persists, seek medical attention. Do not dose ewes at the 'fluke and worm' dose rate, (7.5 mg/kg), during tupping or for 1 month after removing the rams. Can be safely used during lactation. The use of the product in breeding bulls or pregnant cattle is not expected to interfere with their reproductive performance. Dosage: 7.5 mg albendazole per kg b.w. Dosage: 10 mg albendazole per kg b.w. Dosage: 5 mg albendazole per kg b.w. Benzimidazoles bind to nematode tubulin, a protein necessary for the formation and viability of microtubules. This occurs primarily in absorptive intestinal cells resulting in the absence of microtubules in the intestinal cells of the nematode, with the result that these cells cannot absorb nutrients, thus causing a consequent reduction in glycogen and effective starvation of the parasites. Structural differences have been shown to exist between tubulin from mammalian and helminth sources, resulting in the preferential toxicity of albendazole to the helminth and not to the host. Benzimidazoles have also been shown to inhibit the fumarate reductase system of helminths and impair energy production. High density polyethylene jerricans with high density polyethylene screw-fit, tamper evident closures and expanded polyethylene liners containing 1 L, 2.5 L, 5 L or 10 L of product. High density polyethylene flexipack containers with polypropylene screw-fit closures, and aluminium foil sealed polyfaced steran liners containing 1 L, 2.5 L or 5 L of product. DANGEROUS to fish and aquatic life. Do not contaminate ponds, waterways or ditches with the product or used container. Any unused veterinary medicinal product or waste materials derived from such veterinary medicinal products should be disposed of in accordance with local requirements. Below are some recent questions we've received regarding Virbac Wormers Albenil SC, including answers from our team. Once my cattle have been treated, when would I repeat, do the stock need treating before turnout or after a stated time once turnout. It is best to discuss worm control programmes with your own vet so that it can be specifically tailored to your cattle. That said cattle are often wormed in the spring before turn out and in the autumn before housing. However Albenil is a short acting anthelmintic so depending on the age of your cattle and pasture grazing history a further treatment in the summer may be required. Does the drench gun come with the product? No, there is no Drench Gun included, it's only the bottles.